Roger Brook - the no dig gardener: Why gardeners dig: 5: to degrade organic matter and thereby release nutrients! 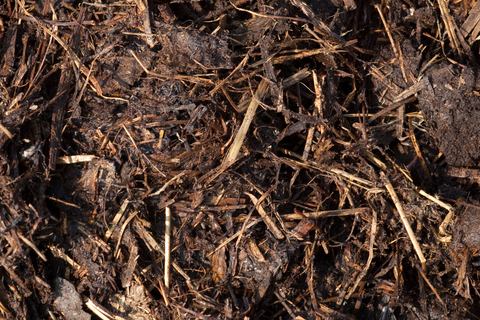 Why gardeners dig: 5: to degrade organic matter and thereby release nutrients! Most no-dig gardeners will be horrified at this notion, but I suggest it is an integral part of traditional gardening practice. The only time I have read this view stated directly was in a French gardening book! My french is not good and perhaps I got it wrong! To paraphrase, it said, ‘cultivate to aerate the soil: this will release nutrients from organic matter to make the plants grow’. The two key elements to this process are generous application of compost and/or manure together with attendant heavy cultivations. Depending on your point of view, this is either a virtuous cycle or a pact with the devil! If you break this pact and fail to add organic matter, soil becomes severely degraded. In the forties, Lady Eve Balfour, a founder of the organic movement, despaired of agricultural methods which destroyed soil structure and necessitated irresponsible use of fertilizer. Traditional horticulture has always used manure and compost. The great Victorian gardens used horse manure from the stables. The commoners owned pigs or other animals and the chickens provided nitrogen-rich droppings.The mill worker (if he ever had time to garden)used wool shoddy, perhaps the first ‘slow release’ fertilizer. The 18th century market gardens in the London Lea valley used a plentiful organic supply from London streets! All relied on cultivations to both incorporate organic matter and speed its oxidation. I’m sure that gardeners don’t say to themselves, “I am digging to speed the breakdown of organic matter to release nutrients to feed my plants.” Nevertheless, it is what happens when soils are cultivated. There is a paradox at the heart of gardeners’ use of organic matter. Maintaining high levels of organic matter brings a myriad of improvements to the soil, yet the breakdown of organic matter releases plant nutrients. No dig gardeners try to have the best of both worlds. Minimum cultivation leads to high levels of organic matter which degrades more slowly. The slower rate of breakdown, but from a high base level, will ensure that plants do not go short of nutrition. One of the advantages of high levels of organic matter is that it holds positively electrically charged ions of nutrients such as potassium, calcium and magnesium on its negative charged surfaces. These are available directly to plants and yet are held tightly enough not to be leached away. Nutrients such as phosphorus, sulphur and, significantly, nitrogen are part of the ‘fabric’ of organic matter and only become available when it is degraded. The bacterial process which releases these negatively charged ions is called mineralisation. The speed of bacterial action is controlled by factors such as aeration and temperature. In warm, well aerated soils the process is rapid and soil nitrate levels rise. A small proportion of soil organic matter known as humus can persist in the soil for hundreds of years. Recently discovered glomalin can last for decades. Most composts and manures are destined to degrade within a year or two. Organic matter does not hold soluble nitrate against leaching. Nor does any other soil mechanism. If nitrate is not absorbed by plants it is likely to be lost to winter leaching. And what is the nodiggardener’s opinion? I found you via a smallholder forum - great blog! Love the chickens! I think many smallholders would be interested in a nodig system of gardening. I arrived that way too. Different forum though. I think many poultry keepers are also allotment holders - certainly on our forum. Thanks Shirley and Mike. I do hope you both keep coming back!